The GAME Micro-Ingredient Weighment system was designed to automatically weigh and transfer micro-ingredient additions used in a production process, as opposed to hand weighing and tipping. 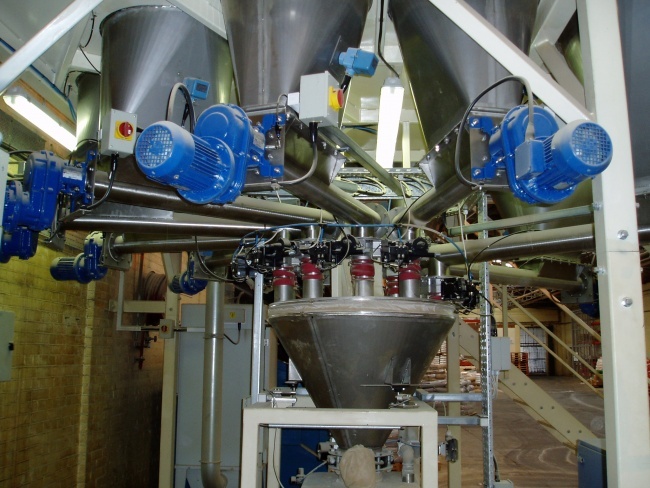 Each of the micro-ingredients to be included in a batch mix are automatically weighed and discharged into a central weigh hopper (mounted on load cells), which is then discharged and blown to the designated process. On completion, the system automatically makes up the next batch. Dust is minimised via a bucket filter during filling, with a reverse jet filter for the mixer top. Other options for micro-ingredients additions, such as hand-weighing and tipping into the blend process are labour intensive and show small, but significant, differences between each blend batch. The GAME Micro-Ingredients System removes the requirement for additional labour and provides dust-free, clean storage for each ingredient. The main benefits of the system lies in the exact repetition of the weighments, providing more effective control over the additions process, while being more efficient and traceable in regards to the actual ingredients entering the process. The system is currently being used across multiple industry sectors and successfully handling and weighing a variety of products. Support: purpose made mild steel support structure to carry 10 micro-ingredients bins. Surface patterned Durbar plate with formed kicking strips, hand railing, pallet access point (from forklift), access stairs and support legs. Ingredients bins: in stainless steel. The bins may vary in holding capacity, according to client specification and micro-ingredients (e.g. 2×1000 diameter to hold 1000kg of product and 8×600 diameter to hold 250/300kg of product). All bins have tops with flanged up stands and hinged lids with locking bolts. Screw feeders: purpose made stainless steel screw feeders complete with direct-coupled gear motor drives. Inlets rectangular flanged, outlets suitable for butterfly valves. Weigh hopper: 304 stainless steel and support frame. Manufactured in cone form with load cell mounting brackets, top cover with 10 inlet tubes, flexible connector, vent and access point. Under hopper: in stainless steel, manufactured in cone form with top cover with spigot and butterfly valve and low level probe. Hopper to have flanged outlet suitable for rotary valve mounting. Top cover connection to filter unit. For an example of one such project please click here. The product bin sizes alter according to customer specification. 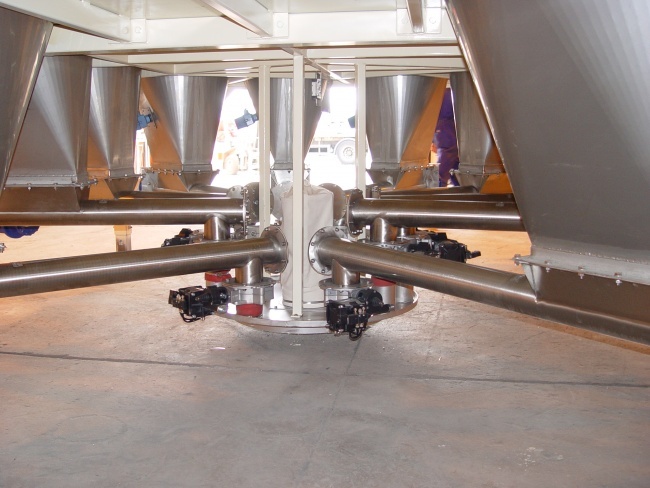 Dust is minimised via a bucket filter during filling, with reverse jet filters for the mixer top hoppers being optional inclusions. In case hazardous substances are used in the micro-additions process, the system drastically reduces the potential for harm from interaction. Continuous batch weighments and mixing increases product through-put and accuracy. Up to ten different ingredients can be stored and weighed at any one time for inclusion in the process and these are weighed and transferred into the process at the same time, as opposed to each ingredient being individually weighed and tipped into the process line.